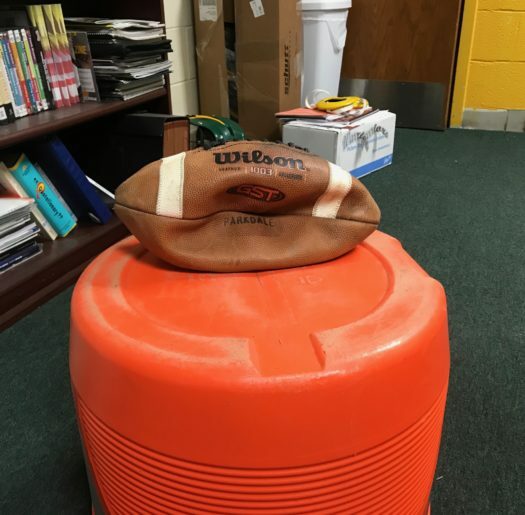 Coach Moore keeps a deflated football to show athletes what they are without academics. According to the National Collegiate Athletic Association, there are nearly 8 million students currently participating in high school athletics in the United States, but only 495,000 of them will compete at NCAA schools. While the county very much promotes participation in sports, it is emphasized that students should “realize that participation in athletics is not only a privilege, but is also an honor that requires responsibility for maintaining one’s academic standing in the classroom and for maintaining a high standard of conduct,” but can students truly recognize that athletic participation is a privilege if the standard set for participation is so low? According to the PGCPS 2018-2019 Athletics Handbook, students must achieve a 2.0 GPA to participate in athletics and extracurricular activities. Parkdale athletic director Coach Moore, who once played football for West Virginia University, doesn’t think this GPA is setting students up for success. The National Collegiate Athletic Association states to be eligible to compete in NCAA sports during the first year at a Division I school, students must graduate high school and earn at least a 2.3 GPA in your core courses, which includes English, math, science and history. The athlete must also earn an SAT combined score or ACT sum score matching their core-course GPA on the Division I sliding scale. Although many student athletes join the team with big NCAA and professional league dreams in mind, many don’t realize what their titles really are: student athletes. While the push to go to college is greater than ever before, some students are finding that student-athletes are winding up with more financial and collegiate benefits than those students who don’t play a sport but have great grades. What many student athletes fail to realize, also, is that there are thousands of other student athletes competing for the same spots on a collegiate team. There are roughly 132,667 students in the PGCPS and 24 high schools. Although an athlete may meet the requirements of the NCAA with a 2.3 GPA, there are many other students with the same qualifications, skill sets, and possibly even better grades. In the rare chance that students do make it to an NCAA school and then on a professional team, there is no guarantee for success. According to the Wall Street Journal’s analysis of data from 2008 to 2014, the average NFL career has shortened in length by about two and a half years. The report also found that less players were being used in the league in recent years. In 2015, 1,973 players played at least one snap which is down just over 100 from the 1,894 in 2007. Many students believe they have a chance to play at the collegiate level, but in reality will not be eligible to play because they have not met the requirements of a 2.3 GPA. Because they were so focused on athletics, they often do not have a back up plan. When students find themselves primarily focusing on reaching the bare minimum in academics and putting their all into athletics, they run the risk of ending up with well, nothing after high school. If worse came to worst and a student athlete chose to go to community college because they were not picked up at the college level, maintaining an average 2.0 GPA wouldn’t get them far in that area, either. One of the key requirements of Governor Hogan’s “free community college” bill is that students must have a high school GPA of at least 2.3, a GPA well above the minimum 2.0 required by PGCPS athletics.